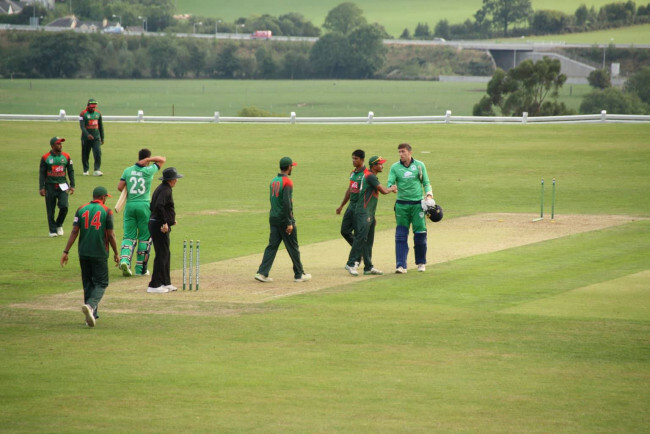 Bangladesh ‘A’ cruised to a victory in the third unofficial T20 match against Ireland ‘A’, though the proceedings were affected due to weather conditions. Consistent rains forced the authorities to reduce the over limit to 18 overs per side, but it did not have major impact on the outcome as Bangladesh ‘A’ steered their chase well enough to avoid any hiccups during their innings. Bangladesh ‘A’ endured an excellent opening partnership, as captain Soumya Sarkar and Mohammed Mithun counter-attacked the Irish bowlers, thus reducing the pressure of the required run rate. While Mithun played the role of the aggressor, Sarkar focused on rotating the strike and keeping one end intact. He eventually departed in the first delivery of the 11th over to Shane Getake, who delivered a late blow by claiming three wickets towards the end. However, the visitors stabilized their innings despite losing a few quick wickets, as they proceeded towards a victory with seven deliveries to spare. Mithun scored 80 runs, but Al-Amin and Mominal Haque’s sensible knocks in the final few overs played a major role in Bangladesh’s victory too. The home side won the toss and opted to bat first, but they could not instill stability in the opening stages of their inning. They eventually lost three wickets within the first six overs, as Mohammed Saifuddin and Shoriful Islam struck early to take control in within the field restriction overs. However, senior player William Porterfield along with Andrew Balbirnie added runs in abundance, with both of them scoring half centuries to ensure that the Irishmen did not succumb to the visitor’s bowling firepower. Saifuddin starred for Bangladesh ‘A’, as he took advantage of the conditions to scalp four wickets by giving away just 28 runs in his four overs. Only Stuart Thompson, barring Porterfield and Balbirnie managed a double-digit score, whilst the rest of the Irish batsmen did not apply themselves well to the conditions. Anyways, they reached a total of 183 runs in 18 overs, with Porterfield top-scoring with a sumptuous knock of 78 runs in 39 deliveries.